Sometimes it makes sense to make changes to the system to achieve improved health and equity. Shadow reports are one example. They are submissions to treaty monitoring bodies to successfully lobby various UN bodies such as the Committee on the Elimination of Discrimination Against Women, the Commission on the Status of Women and the High Commissioner for Human Rights. They often address omissions, deficiencies, or inaccuracies in official government reports. The shadow reporting process plays a critical role in holding governments accountable to their international human rights obligations. 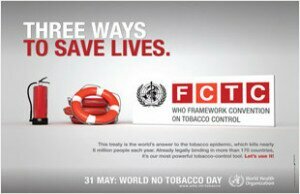 The Framework Convention on Tobacco Control (FCTC) is the world’s first international public health treaty, adopted in May 2003, by the member countries of the World Health Organization (WHO). Argentina signed the FCTC on September 25, 2003. By 2012, Argentina, the second largest producer of tobacco in the region, was one of the few countries in the world and the only one in South America that had yet to ratify the FCTC. Rates of smoking for women in Argentina are approximately 22%. It’s estimated that tobacco use causes 40,000 deaths annually in Argentina; policies recommended by the FCTC could save 16,000 lives (53). In July 2010, a diverse group of national and international women’s and civil society organizations submitted a ‘shadow report’ to the United Nations Committee on the Convention on the Elimination of Discrimination against Women (CEDAW) (54). The report, Challenges in the Prevention and Reduction of Women’s Tobacco Use in Argentina, described how Argentina could improve its tobacco control policies and highlighted the negative health impacts of tobacco use in women. After its official review, the CEDAW Committee released its concluding observations, which encouraged the Argentine government to ratify and implement the FCTC. This report was important in making links between tobacco, gender, and human rights. It was also one of the first times the CEDAW Committee had made a specific recommendation on implementing tobacco control measures. A Shadow Report is a report submitted to an international human rights body (such as the human rights committee) by any organisation other than the government. The purpose of a shadow report is to supplement, or “shadow” a Government’s report by outlining the observations, claims and concerns of the organisation. View A guide to tobacco-related shadow reporting before United Nations human rights bodies from the O’Neill Institute.